Pure and fragrance-free, this is a beautifully soothing soap for delicate skin. 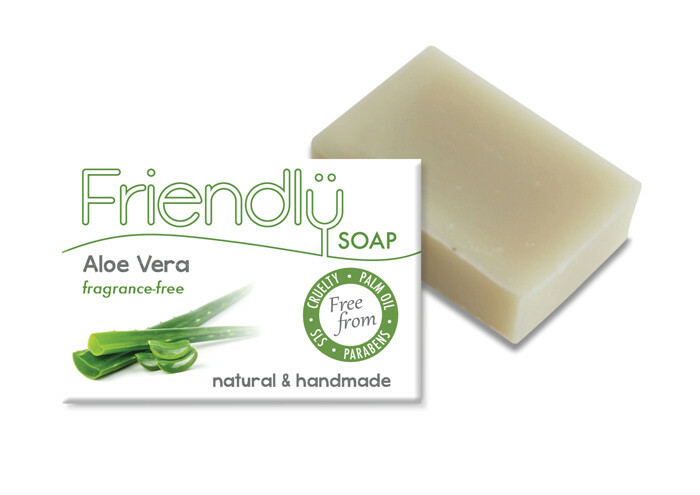 Our Aloe Vera soap contains only the most gentle natural ingredients. There are no fragrances, colours or harsh chemicals – just naturally moisturising oils and nourishing Aloe Vera. Aloe Vera Soap has just four ingredients make up this pure and gentle soap: Coconut Oil, Shea Butter, Olive Oil, Aloe Vera. Plus some water. Rich in vitamin C, E and beta carotene, and has been renowned for centuries for its nourishing and skin healing properties. 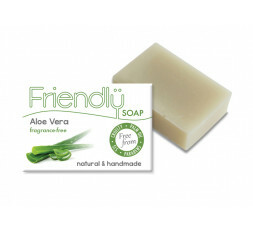 Meanwhile, the natural oils create aloe vera soap that is wonderfully rich and creamy. It all combines to make a perfect soap that will clean and care for even the most delicate and sensitive skin. All our soaps are Free from Palm Oil, Parabens, Sulphates, Triclosan, Phthalates and Cruelty, as well as being boxed in plastic free recycled (and recyclable) packaging. We are also registered with The Vegan Society, Cruelty Free International and have a Best rating with Ethical Consumer. Free 1st class or courier delivery on orders over £20 to UK, under £3.29. EUROPE & Ireland: Orders over £100 free, under £10. REST OF WORLD: Orders over £120 free, under £15.